We’re having some warmer temperatures this week – not complaining! – but fall and it’s brisk temperatures and cool breezes is soon to come. Let’s fashionably plan ahead. A must have item (or items) for fall, is definitely the blazer/tailored jacket. I am having a bit of a blazer moment. I think a fitted jacket is to your wardrobe what mascara is to your makeup collection, an instant pick me-up, and a polished finish. The core of my wardrobe is a pair of skinny jeans and a tank top and I would wear all of these jackets with that base. Swap out different shoes and accessories and I am set for the season. Be school girl chic in traditional styles featuring tartans, plaid, and elbow patches. The fit here is slim and youthful, too structured and boxy and it may look like you borrowed a Captain’s jacket. Tip: Shop the boy’s section for a snug fit with this look. Make a statement in jackets with details that speak volumes. Play with bold and bright colors, beaded details, and rich fabrics. Pair these jackets with simple pieces so as to not look overly done or matronly. Tip: Shop vintage and thrift stores to find great colors and patterns at great prices, a simple tailoring can update the fit. 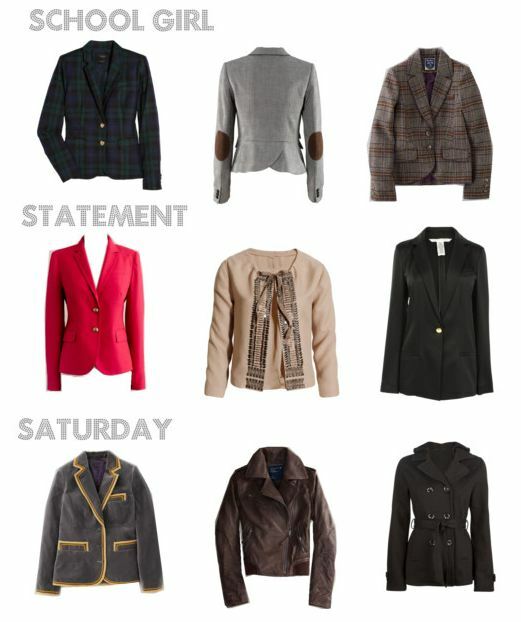 Be stylish on the weekend in Saturday perfect jackets. Easy to add to an outfit, and not cumbersome for weekend errands, these jackets are warm and made from tough fabrics: leather, knits and velvets. Find the right slim fit, too big and bulky you might as well wear sweats. Tip: Shop in unexpected places like the active section as many fitness/casual brands also add non-workout clothes to the mix. What is your jacket style this fall? This entry was posted in Her Closet, Shopping and tagged blazers, color trends for fall, fall blazers, fall jackets, fall shopping, fall trends, jacket trends, leather jacket, schoolboy blazer. Bookmark the permalink.